In typical Melissa McCarthy fashion, she headlines The Boss in a slapstick, outrageous comedy about an industry mogul who is sent to prison for insider trading and has learn to adapt to being penniless. When she leaves prison she is ready to remake herself as a beloved citizen. Some of the people she did not get along with are not quick to forgive and forget what she did in the past. 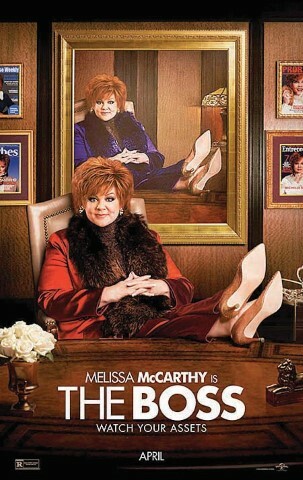 McCarthy is joined by Kristen Bell, Peter Dinklage and Kathy Bates in lead roles. In the movie, McCarthy moves in with her former secretary (Bell) sleeping on her sofa bed a new experience for the rich socialite. McCarthy becomes close with Bell and her daughter. The daughter is enrolled in a group similar to the Girl Scouts which sells cookies to neighborhoods. McCarthy goes with the daughter to a meeting and decides she can create a business model to market to the same crowd, but with brownies. She plans to give the kids commissions and matches it towards a future college education. She goes all in drawing up plans for helping the brownies succeed and takes Bell on as her co-business owner. McCarthy goes head to head with the cookie leader (Annie Mumolo) and they do not get along. McCarthy gets into a fight with Bell in the end and decides to sell her business to another person, but has a change of heart and decides to not get rid of the company. There is a childish fight scene and a stupid break-in scene. Over all, the movie is funny, but profane and not recommended for younger children to see. There is a lot of extreme crude sexual content. I would not recommend this movie to the senior generation or for kids in high school or younger. If you are looking for a good date night laugh at a stupid movie this is the movie for you.